If you’re the type of person who likes taking their lunch to work with them you know how important it is to have a good way to keep your hot foods hot and your cold foods cold. Finding the best soup thermos is one way that you can make sure your food will taste great when lunchtime rolls around. But how do you know if you’ve got the right one? These tips and tricks are definitely going to help you. 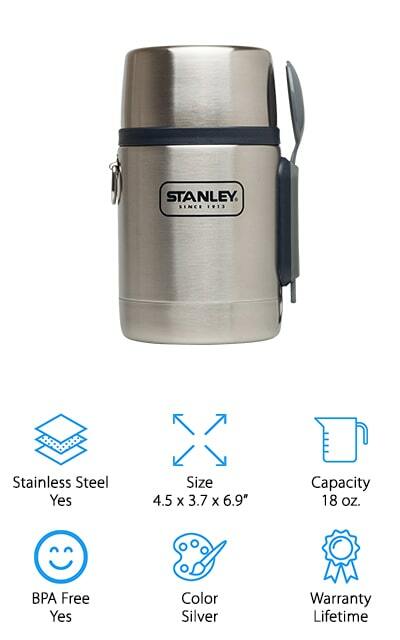 Stainless Steel: Is the thermos itself made with stainless steel or some other material? Stainless steel isn’t a necessity to get something that’s good quality, but it’s definitely something you’ll want to at least consider for stain purposes and heat retention. Size: Just how large (or small) is the thermos that you’re looking at? You want something that will hold enough for your lunch but you don’t want something too huge because it gets awkward to carry, plus you end up with leftovers to take back. Capacity: How much soup will you be able to take? Once again, this is going to be about keeping things simple for you and making sure you don’t have to carry that soup back and forth over multiple days. Just take what you need. BPA Free: This is somewhat of a personal preference and somewhat of a health feature. Keeping BPA’s out of your food and out of things that hold your food can definitely be important, but for some people it’s not as important. Warranty: A warranty means that a company stands behind their product and that’s definitely something that you want. Make sure you get something with a warranty that says you can count on the product to last the way you want. With so many thermoses out there, on shelves at practically any store, it can be a daunting task to find one that works for your needs. That’s why we’ve created the best soup thermos reviews, so you can make sure that you’re off to the right start. Get the ideal soup thermos for your next trip to the office, so you can enjoy your favorite lunch every time. Our top rated soup thermos has a whole lot to offer, even with the small size. At 16 ounces in total capacity, it provides enough space for your favorite foods and even has its own folding spoon so you’re always ready to go. Made by the company that wrote the book on any thermos you own, this one comes in midnight blue but has several other colors as well. In fact, you can choose between cranberry, matte black and stainless steel to match your own personal preference. It has an easy fill, wide mouth, and the lid can double as a bowl so you don’t have to eat right out of the container. Not only that but it’s durable and can hold hot or cold products. Keep your hot foods or beverages hot for up to 9 hours and cold ones at the right temperature for up to 14 hours with no problem. Once you’re done, just wash it out or put it in the top rack of your dishwasher to get it ready for next time. 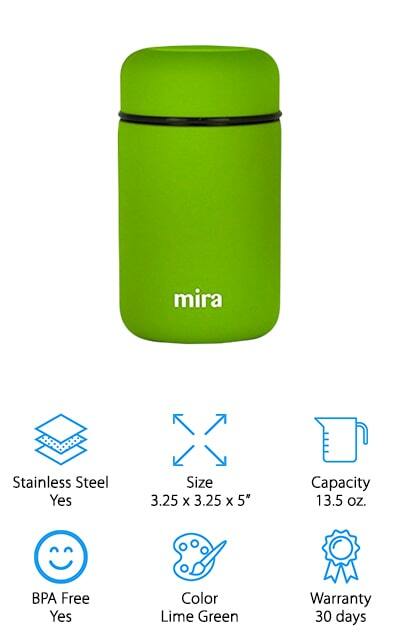 Our budget pick is definitely a unique looking thermos with the bright green color, but it’s available in several colors to match your lunch box or your preference. Available in denim, purple, rose pink, sky or teal, it’s actually vacuum insulated and stainless steel on the inside for better cleaning and heat retention. The wide mouth makes it super easy to fill with anything you want and you’ll be able to keep items hot for up to 5 hours or cold for up to 10. Completely BPA, phthalate, lead and PVC free, everything about this container is food safe and satisfaction guaranteed. If you want to try it out you can get a full refund within 30 days if for any reason you’re not happy with it. If you really want your hot food to stay hot you’ll take it along in this. It’s a 20 ounce, lunch sized crock pot. One of the best rated soup thermos options, it comes in pink, black, blue and red, so you can choose your own favorite. Even better, it has a handle to make carrying easy and has a spill proof lid. When you use the crock pot you don’t have to worry about it getting too hot either, because the outside stays cool to the touch while the inside keeps your food nice and hot. When you’re done with it for the day all you have to do is put it in the dishwasher and it’s ready to go. The interior container removes easily to load up and then you can slide it into the exterior casing, which can be plugged directly into the wall, keeping everything just the right temperature for when you’re ready to eat. This company definitely knows something about making a thermos and that’s why this is one of the best hot soup thermos options out there. The vacuum insulated jar comes in a stainless steel cover and even has a special attachment on the outside for the included spork. Inexpensive already, it’s 18 ounces and available in 2 additional sizes if you need something a little smaller or larger. The wide mouth means that it’s easy to fill up with anything you want and the lid separates into sections so you can use the top as a bowl. 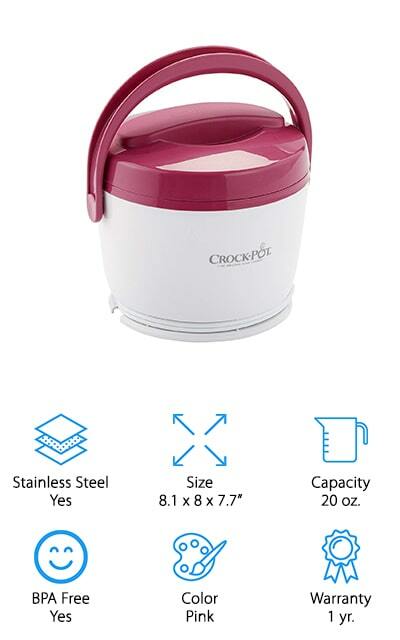 Leak proof and BPA free, it can keep your food hot or cold for up to 15 hours with no problem. What’s even better, however, is that it actually comes with a lifetime guarantee, so you can trust that it’s going to keep working for you. 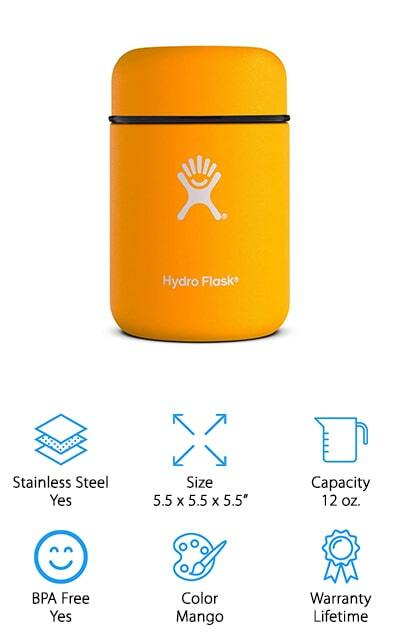 This bright orange thermos comes in several bright colors from lava and mint to pacific and kiwi so you can get a fun color that matches your preference. 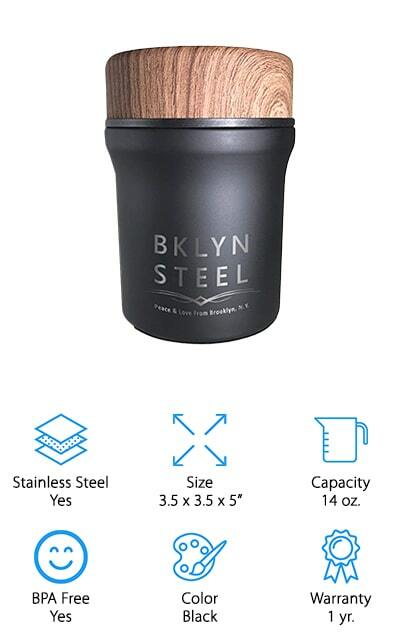 It’s available in a 12 ounce or 18 ounce version and is made with stainless steel to keep anything you want hot or cold for up to 3 hours. 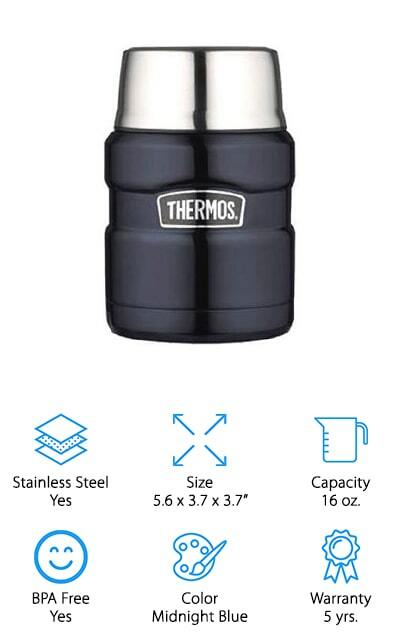 Great for a snack or a small meal, this thermos has a vacuum seal on the inside and it’s built to be strong, so you can throw it anywhere to carry along and it will be ready for you, with no leaks. The wide mouth means that you can easily put anything you want in here and the sweat free powder coat helps keep it ready to go. It’s the lifetime warranty, however, that really makes this the best soup thermos ever. This 17 ounce hot soup thermos is designed to hold your favorite lunch with no problem. The airtight cover on the inside means that you’re not going to have any leaks and all you have to do is press a button in order to open it up. Made with high quality stainless steel that’s completely food grade, you’ll have something durable, that won’t rust, break or bend. It’s designed to hold heat for over 6 hours and has a wide mouth that makes it even easier for you to fill it up with whatever you want to take along. The moderate size of this thermos is great for a lunch or even for a snack and the fact that you can pour some soup into the lid, which doubles as a bowl, makes it even more convenient. You’ll even get a full month warranty that says it’s a good quality. 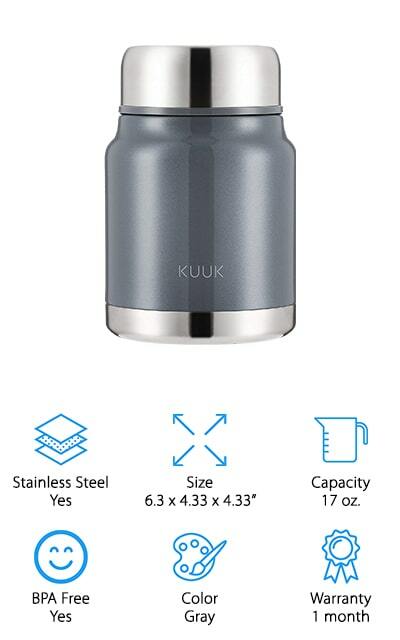 This 16 ounce stainless steel soup thermos is designed to hold your favorite dishes so you can enjoy them anywhere you go. 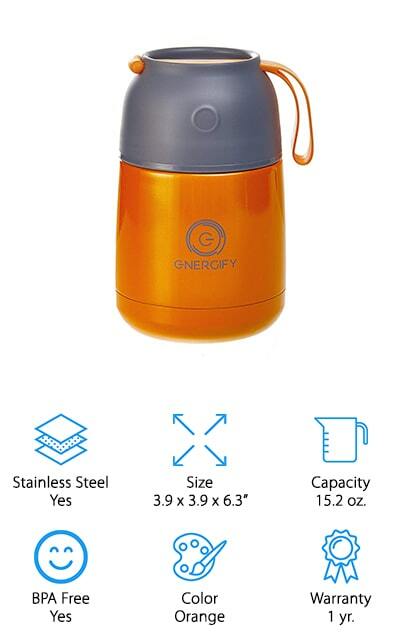 It’s leak proof and has an interior of stainless steel that’s vacuum insulated to keep everything hot. On the outside, you can choose between everything from deep ocean to lilac, midnight black to autumn and a whole lot more. In fact, there are a total of 18 different colors that are all different shades of blues, grays and more. Able to keep your food cold for up to 10 hours or warm for up to 4, this jar has a wide mouth that will make it easier to get into it and it actually has an added copper coating to make it even more insulated and keep it from sweating or transferring temperature. This unique looking insulated soup thermos is designed to work for just about anything you might need. It has a tag handle so you can hold it easily and has a bag that makes it even easier to carry along. Great for children or adults, this thermos holds 15.2 ounces, though it’s also available in a larger size as well. Choose between the bright orange or a dark gray but get the vacuum seal that you’re looking for no matter what. The food grade body and the BPA free materials mean that you’re getting exactly what you need for your next lunch at work or anywhere else. The wide mouth makes it easy to fill and eat from and the fact that the lid doubles as your bowl makes it even simpler. You can open it easily with the air pressure release button and you get a risk free guarantee. If you’re looking for a small thermal container that will hold enough for a snack or a small meal then you’re definitely going to want this 8 ounce option. It’s stainless steel on the inside and the outside with a fun blue lid to add a little bit of personality. Able to keep hot foods the right temperature for up to 6 hours and cold ones for 12 hours, it’s entirely leak proof as well. This thermos also comes in different color options including pink, black, light blue and green. With a triple insulation process, it’s durable and works well with other products from the same company. 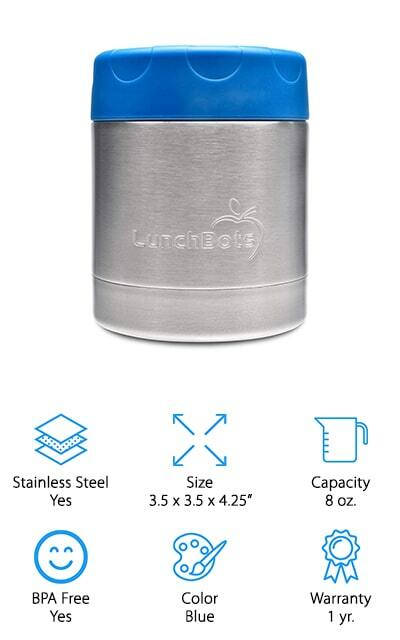 You’ll even be able to throw it directly into a purse or backpack without having to worry about spills or fit it into the specially made LunchBots options. 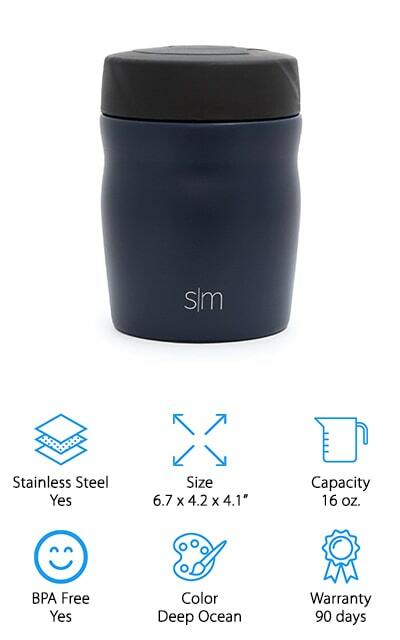 This thermos definitely looks unique and it’s a great option for anyone who wants to take their lunch with them when they go out. It has a wide mouth that makes it easy to fill and eat from and holds 14 ounces of your favorite soup or other meals. It’s vacuum insulated and leak proof as well as being insulated with copper to make sure that it doesn’t transfer heat or cold. The combination of stainless steel and copper mean that it’s not going to sweat either and it’s great for anything you might want to take along. The unique wood look of the lid makes it a lot of fun for anyone to take and the larger size than other similar products means that you won’t have a problem taking enough to keep you full until dinner time.